Last night I posted a card I made for a military wives Christmas card swap. This is the 2nd card I made for the swap, I don't like sending the exact card to everyone so I made several cards of each design. This elf from MFT was really fun to color! I stamped the image on X-Press Paper and brought the sheet to work and colored all the elves on my break and lunch. Then I just had to cut them out at home and put the card together. 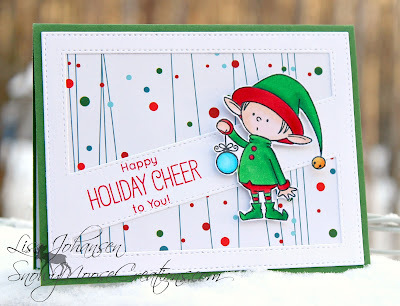 I used the MFT diagonal cover up die on this card. These dies really make it so easy, I am addicted to them! This is so adorable :) love those colorful dots in the BG ! So cute! I like the pp you used in the background; it's very festive.